The astrological underpinnings to cultural phenomena can sometimes be jaw-dropping. Such is the case with the BBC’s long-lived sci fi series Doctor Who. Key aspects of the series and the Doctor himself jump out with dazzling precision from the chart of its premiere (5:16:20 PM November 23, 1963, London). It’s a perfect expression of the series’ premise, which follows a mysterious time lord on his travels through time and space. Most of the defining elements appear in the chart’s packed sixth house, which describes day to day affairs as well as the role of service. The line-up delivers a super-sized dose of adventure, exploring, a teaching, mind-expanding streak, journeying far from home base (mentally and physically), an on-the-go “Don’t Fence Me In” imperative. These characteristics come from four pivotal placements in Sagittarius, starting with the Sun in the very first degree of the sign. This gives the show’s basic personality the rawest, least refined expression of the sign: pushing beyond normal horizons, interacting with the foreign, an educated mindset that can be philosophical, optimistic and yet judgmental, and, speaking more of the show itself, a bent for media. Fueling these traits to epic proportions is an easy flow between the Sun/Mercury team and the sign’s ruler Jupiter, in impulsive, daring, self-starting Aries. (Interestingly, three of the lead actors not only have the sun in Aries, but conjunct the premiere’s Jupiter: the 5th, Peter Davison; the 10th, David Tennant; and the 12th, Peter Capaldi.) The combo is an intellectual cousin of Captain Kirk, who uses his mind instead of his fists. He’s also wired for companionship. 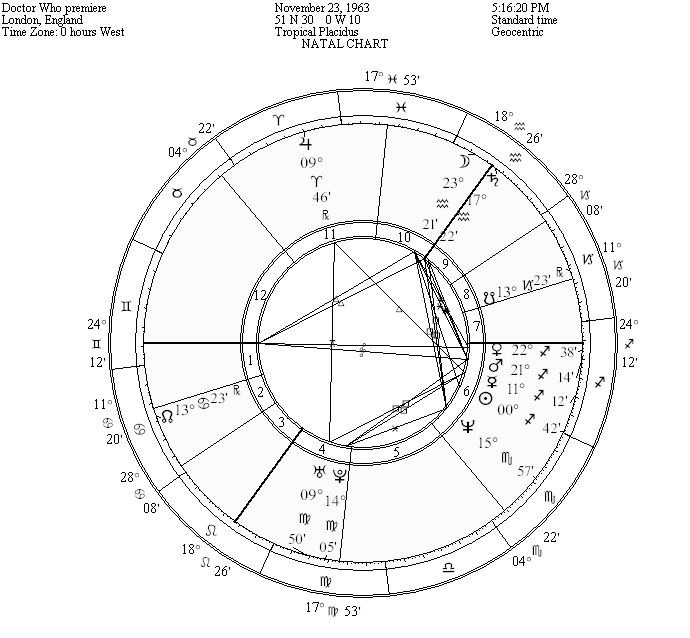 A female companion has traveled with the Doctor from the beginning, and, no surprise, the device is in the chart: a tight Venus/Mars conjunction right on top of the doorway to the partnership house. Venus represents not merely a woman, but relationship and values; Mars is both a man and the masculine drive. This lineup shows a man and a woman adventuring together. It also describes the show’s internal consistency, which has remained despite changes in cast, writers and show runners. A shroud of mystery, fantasy and dark undercurrents comes from the remaining sixth house planet, Neptune in the middle of Scorpio. This injects illusion — and the broadcast screen — into the show’s purpose. Versatility, verbal skills and quick-change artistry are shown by the Gemini ascendant. This sign underscores the flitting nature of the plots, which have darted from one story line to another, rather than clinging to an insistent arc. More telling, though, is the activity on the angle at the top of the chart. The midheaven shows the show’s career, reputation and reach out into the world. This midheaven accurately describes not only characteristics of the show, but its role in the world. The MC is sandwiched by the Moon in Aquarius — progressive, futuristic, bent on the greater good, alien, the Doctor’s distant-to-nonexistent emotional nature — and the time lord Saturn. This bears repeating: The time lord Saturn is on the midheaven of a show about — a Time Lord! The planet also indicates authority and longevity (and the long delay in production that would come in 1989), while the 10th house Moon lends charisma and a quirky, commanding and distant charm to both the character and the show. That Moon placement also shows great public appeal and affection, and a network of fans, ultimately linked by technology. The Cancer North Node shows a purpose of nurturing and protecting. The Doctor’s adventures frequently have him stepping in to save a society. Creating a family of fans has been an offshoot, and long with that the potential for financial growth and security. And what of the defining characteristic that later developed, the Doctor’s regenerating? It’s in the chart. Pluto, the ruler of death and rebirth, is in an adjustment aspect to that Saturn on the midheaven. The time lord, and the show, would periodically undergo a transformation that is not linear, such as snake shedding its skin and coming out looking like the same snake, but a radical adjustment. The core is the same, the power of the Time Lord remains, but the shell and parts of the personality have changed. This is true, once again, of both content and form. The Saturn/Pluto link builds regeneration and magnetism into not merely the character, but the show’s existence and appeal to the public as well. Do take a look as well at The Daily Madame’s superb summing up of the Doctor and his Sadgeyness, A Time Lord turns 51 (at least): The Astrology of Ultra Sag, Doctor Who. © Kathy Biehl 2014. All Rights Reserved. You may forward this article as long as the copyright notice is intact. No part may be used or reprinted without my prior written permission. Karma, ya know.